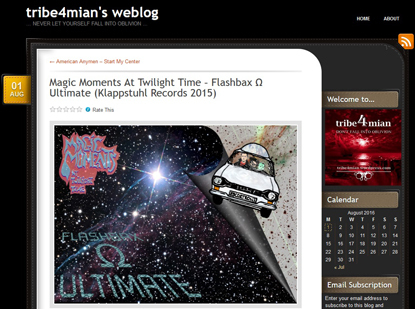 What started out as an idea to reissue one of the Flashbax Tapes Series soon turned out in a demanding project driven by the enthusiastic Mick Magic (you can read an interview we did with him a few years ago HERE) to create an ultimate Flashbax, showcasing the best of M.M.A.T.T…. featuring all the different line-up’s with Shona Moments, Lulu Jackson, Pete Program, Kate Twilight and Jay Time performing some of the best alternative psychedelic space pop rock with female vocals ever made . More than 3 Months in the making, transferred from the original masters by the bands supremo Mick Magic, re – mastered painstakingly and lovingly by Frank E. and supervised by 6 9 N & F you can hear the famous underground space pop rock from the first recordings from 1987 with selections from their cassette only albums up to 1992, just before work on the 1996 CD Album “Creavolution” (Music & Elsewhere) began. Klappstuhl Records have released Flashbax Ω Ultimate on 25.10.2015, simultaneously as CDR Album and Digital Album. The digital version includes a further rarities Album ‘Flashbax Alpha II’ with the secret single “Freedom Overflow” and the original 30+ Minutes Session Version of “Sister Jody”. Each CDR copy comes with an additional dl code to get all the bonus tracks and an extensive pdf booklet detailing the band’s history by M. Magic as well as printable artwork etc. The download version is available on Klappstuhl Records Bandcamp page, if people want to order the hard copy on disc, they need to contact Klappstuhl, the link for which is just above the ‘redeem code’ one. There’s nothing wrong with pop and rock music for the space age and remembering the times when everything seemed to be possible – with just a some DIY spirit and the tools at hand. Will this be the last M.M.A.T.T. release or a new beginning ? ?